I used to think I had the best job in the world, education & outreach officer at Birmingham Archives & Heritage; a sublime mix of delving into the past through archival documents and photos and working with young people and community groups to document their lives and our changing city. 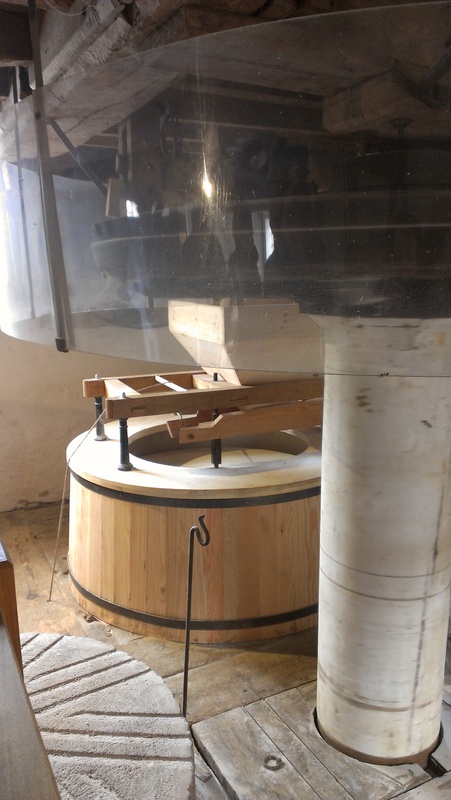 Then in January I answered the call for volunteer millers at Sarehole Mill. Suddenly every waking thought was about millstones and wheel revolutions, about chutes, tuns, hoppers and damsels and I found myself in a new world of the old. Now of course it all makes sense; a seamless path from researching and recording stories about Birmingham’s history to real life hands on experience. I am part of a team of volunteers learning how to operate the mill following it’s major £450,000 restoration and refurbishment project. Sarehole Mill is one of only two surviving working watermills in Birmingham ( the other is New Hall Mill) and there have probably been millers doing what we have started to learn to do since the Tudor period, although our existing building has only (!) been here since about 1750. Standing alongside the wheel pit, feeling the fineness of the flour as it descends the chute from the stones above, recording the highs and lows of the milling day, at the same desk that the miller recorded his own log, puts you in touch with millers of the past (though we can only look on in admiration at their production in comparison to our paltry offerings). I like to think that millers from the past had the same rush of excitement I feel, each time the inner sluice gate opened and the water flooded onto the wheel with a loud roar, to power the stones and the grain hoist and remind everyone that there is proper business at work in the mill. But it is the stories in the mill that are my greatest joy: Standing by the flour chute or next to the hopper, watching the grain feed into the stones, you are an open invitation for people to chat to you about what they see and feel and remember. This has been a powerful and fascinating experience. Many people have recollections of the mill from long ago; stories of playing there, wading up the stream to it, and of the derelict building. I have spoken to a woman visibly moved by the renovation and the actual working of the mill and heard stories of a man’s grandfather’s mill in India producing chapati flour. Sarehole Mill is an immersive archive experience. The archives have been essential in the mill restoration, in developing a team of millers who appreciate the history of this particular mill, and in inspiring and enthusing a new audience.